My friend, Connie (of Connie's Crafty Creations), sent me the nicest card last week! I could hardly believe that she made that beautiful rose on the front, and it didn't take me long to find the punch she'd used and order it! As you can see, I didn't waste any time putting my new punch to work. My card was inspired by her lovely creation and by her sweet friendship through my blog! To create that two toned look, I inked the edges of my roses with Fossilized Amber Distress Ink and spritzed them with water. I let the water work it's magic and the colors run just a bit before heat setting them with my embossing tool. By layering different amounts of petals, I formed three different sizes of roses for my card front. The biggest uses all four layers, next down - three layers, the smallest uses two. Shoregirl, I am in love with your card. The pop of yellow against the white is striking! It just keeps me looking, and drooling :) And have I mentioned how much I love bakers twine. haha. Great Work, TFS at Word Art Wednesday!! What a great sentiment! LOVE the yellows, your card is gorgeous (as always!!). 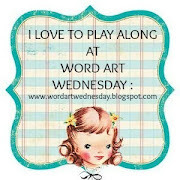 Thanks for visiting and commenting on my blog :-) Thanks also for sharing this beauty with us at Word Art Wednesday! What lovely happy mail you received & oh my goodness--you sure were inspired by it! I'm not usually big on yellow, but your card is stunning! Your card is so beautiful! I love the gorgeous roses and embossing and the sweet sentiment!